I live in the south of the Netherlands with my boyfriend Tim. COULD YOU TELL US A BIT ABOUT WHAT YOU DO? I work at an Asian food distributor. We have many Chinese speaking customers, and since I have studied Mandarin Chinese I provide customer service. I love designing as well as creating blog and podcast content. I also like watching podcasts while I’m crocheting! I’ve been blogging about my craft since 2012, before that I had a travel blog when I was in China for a year. I am totally addicted to Instagram! Ilove the warmth of the crochet community and interacting with others. I’m also quite active on YouTube, where I post new podcast episodes and tutorial videos. HAVE YOU MADE NEW FRIENDS THROUGH BLOGGING? I’ve made lots! I’ve been blogging for the Dutch yarn brand Scheepjes for a few years, and our “blogger tribe” is just the best! When my mum visited me during my studies abroad, she brought me some crochet kits you could make nostalgic Dutch treats with. The first instruction was to start with a magic ring, which I hadn’t heard of back then. I remember being frustrated at first, but I made it work and haven’t looked back since. A pattern I was crocheting wasn’t working out the way I wanted it to look, so I modified the pattern. It all snowballed from there! I mostly designed amigurumi animals and home decor items, now I’m looking into designing garments and accessories. Sometimes it’s the yarn, a picture I see in a magazine, a flick through my Instagram feed, or the colours of the sky. It may be a song or a movie. Some start from a “need” for the finished product. For example, our new living room could really use a nice rug, so now I’m looking into colour combinations and textural stitches. 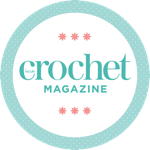 WHAT IS YOUR FAVOURITE CROCHET DESIGN? My all-time favourite crochet designs are my little triangular birds I now sell as crochet kits. Each time I make one I fall in love once more, they are just so cute! I’ve got plans to add Percy the Flamingo, Alfred the Kingfisher and Francis the Mallard. Lots of yarn, obviously! And daylight. I love spending time in my studio during daytime as it is much easier picking colour combinations, taking pictures or shooting videos without having to edit them too much, and of course I also need good lighting to see my stitches. I’m working on a crochet sweater design, where I’m combining two very different types of yarn. One is a sparkly wool-blend yarn which will make up the main body of the sweater, then I’ll add some lace rows here and there using a very thin cotton yarn. It’s going to be the perfect classy but cosy sweater for a colder day.